I'm doing the same - checking the tree every few days and watching the goodness flowing in. I'd like to ask if it's possible to customize the buttons with different color schemes. 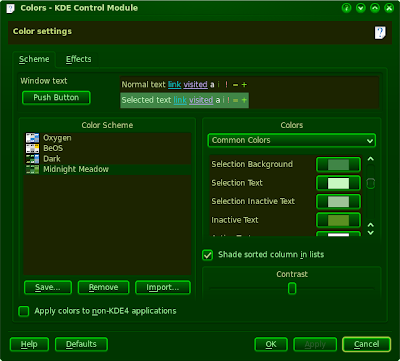 For example, in the first picture, imagine the OK button with a blue metalic color, Apply in green, Cancel in red. Yes/No dialog boxes with blue and red. Of course it's not really cool for the color-blind, but I'd like to have a colorful desktop experience. Nice screenshots, I like them! Looks like Oxygen is really going to rock! In SuperKaramba the main loss of performance in KDE 3 was the fake transparency. Fortunately we are now rid of it and moving themes is much faster now. Unfortunately the switch to QGV costs about the same amout of cpu time that was gained. Also I think SK is a good performance test for Plasma since SK themes are more complex than anything that is running on Plasma right now. I am pretty happy about the performance there. 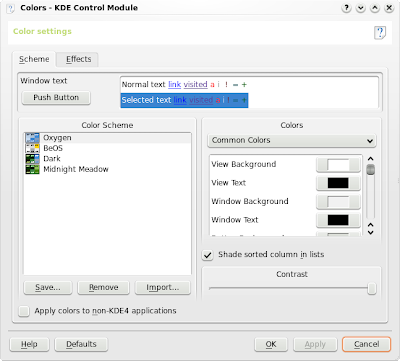 Really the only thing that I'm still waiting for in KDE4 is a proper panel, and to change those window buttons. They don't move into the corners of the screen if you maximize your app, so hitting is very difficult. This _really_ needs to change. Plastik window buttons were great for that. Aside from that KDE 4.0 is in pretty good shape already. Please!!! The new taskbar is horrible! Why you don't use the black & glass taskbar what you used in the mockups??? The Oxygen style looks good and the colorschemes make sence. I would however appreciate it if there was a predefined one with high contrast but not too gray. Just with some color, preferable towars red and yellow (would become then slidly brown). This would be a good alternative and might look more friendly. I personally would also change the green Heading imediately to something with higher contrast. Probably something blue. "Yeah, not a huge difference." Excuse me, please? There is a huge difference on my monitor: low contrast oxygen is grayish and it's hard to tell exactly where the borders of each widget are placed. Using the high contrast oxygen, it's much clearer. Wow, the screenshots look awesome, really! a) To all who complain about this and that not being there: why don't you read some of the other blogs on the planet before complaining about the same things over and over? The panel is not the final panel, it only fills in. A main panel is being worked on right now. b) The higher contrast is great! I think this improves the oxygen theme greatly! Thank you for that work! c) I am very glad to hear that plasma does so well in terms of memory usage. That was always a concern and never really addressed since the code was so much in flux. I am relieved about this. they are all either extreamely bright, or extreamely dark, the four shown all hurt my eyes. I could not stand looking at any of these longer then it takes to change them. If the first two are accurate representations of what Oxygen will be in KDE 4, and every screenshot I have seen of Oxygen are nearly the same, then I'm sorry but, I will Never use it. Will KDE 3 color, and style schemes still be usable with KDE 4 ?? I think would be wise providing a default scheme suitable for untuned monitors. It doesn't need to be the graphical "perfection" but a dirty maximum common divider that makes its work. We can't make assumptions on users' monitor settings, (as Apple can do for its Macs), and I think we can't request every user to tune his monitor for using Oxygen at its best. Wow, many comments. Let me try to address the issues. Zeroum: no, you can't change the buttons separately, that would be a theme-specific thing. @many: YES the taskbar looks horrible. Does anyone even READ what I write? It's not ready! @many: those colorschemes are just some basic examples. 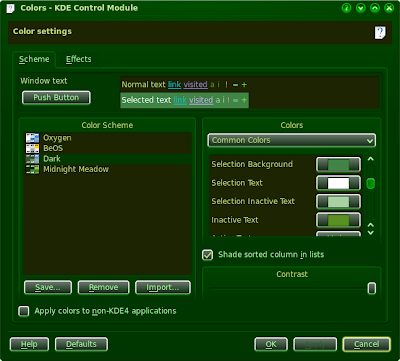 You can't use KDE 3 colorschemes, so we need new ones. I'm sure contributions are appreciated. Maybe wait for beta4/RC1 with those, though. 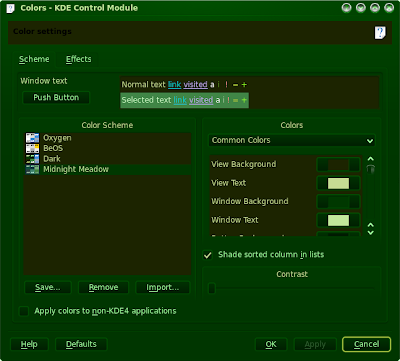 A couple of questions about the preview -- is there going to be more stuff there, like the window decoration, scrollbar, and menu stuff as in KDE3? Maybe even a live preview of the actual window decoration used, instead of the generic one the KDE3 color settings page uses. Also, I hope the feature where you click on an area (like the button for example) to bring up its color category, for the people who don't know what the setting is called, but can see in the preview what they want to change. Finally, in the default scheme, the color button for Inactive Text says "Varies" -- it is not clear what this means, or how to restore it after setting it to some actual color value. I've asked Matthew about this, and he told me he doesn't plan on increasing the preview. It shows all important colors - eg the windowdecoration should just use the normal colorscheme, instead of having something special. > Finally, in the default scheme, the color button for Inactive Text says "Varies" -- it is not clear what this means, or how to restore it after setting it to some actual color value. That 'varies' is because you can specify separate colors by using the dropdown above the colors. If you use it, it becomes clear what it means.